St. Lucia is a small tourist town right at the St. Lucia Wetlands Park. The iSimangaliso Estuary is South Africa's first world heritage site with 8 ecosystems coming together in one place. The number one reason we traveled to St. Lucia is because we wanted to see some hippos. We got our wish! But first we went on a fantastic 2.5h horse-back ride with Bhangazi Horse Safaris at St. Lucia Beach and in the game reserve. Earlier that day we had been joking that Scott's horse will be badass, probably with only one eye... Little did we know then that he would actually ended up on the one horse with only one eye. He likes to nickname him "killer", whereas the stables like to call him Pirate, as he now wears a pirate eyepatch. In truth the horses name is uGandaganda, which means Tractor in Zulu... because he is big and slow. 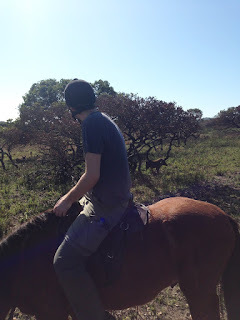 The horse I was riding was called Lesotho (pronounced Lesutu) because she was a Lesotho mountain pony. There is a warthog (you may know him as Pumba from the Lion King) under that tree. He wasn't sure what to make of us on the horses. This is our excellent guide explaining to us how to open monkey oranges, and then we got to taste them. They are like a citrus fruit but have the consistency of mushy banana with big seeds. Quite tasty, though the one we tried was tart. They are these perfect spheres and they have quite a hard shell, like a nut protecting the gooey inside. These ones stay always green, so the only way to know that they are ripe are by waiting until they fall off the tree. Then you have to just be quicker than the monkeys to collect them. Three female (on the left) and one male (on the right) waterbuck, sometimes they are nicknamed toilet seat for the round white marking on their butts. I have been wanting to see Zebra's up close forever and I couldn't believe that we were able to get this close to them on horseback. What a fantastic experience. This is a plains zebra, recognizable by it's brown stripes, mixed in with the black and white. A small herd of wildebeest. ...oh and over there ... hippos poking their heads out of the water. Here a baby hippo with mommy. Baby hippos can suckle their mothers milk under water. This river is lousy with hippos! Just having a yawn with its 10 absolutely huge and very deadly teeth. Hippos are hugely territorial and very dangerous animals. They like to walk the town's streets at night and a few months ago a tourist was attacked. According to our boat captain, hippos can bite crocs in half. Baby hippos like riding on Mommy's back, but it never lasts long, she shrugs them right off. I wish we could have seen any of them out of the water but this is the best close up I was able to get. This one has attitude ;). And to finish it off another African Fish Eagle.